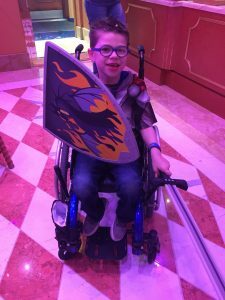 Expenses with a unique child can be outrageous for families and we are no exception. We try very hard to make life as “normal” as possible for Linden. Honestly “normal” doesn’t even make sense but for the purpose of this blog I’m going to use that word, loosely. Linden’s average week includes full day school, five days a week. After school he has therapies totaling six times a week. These include Occupational, Physical and Speech therapy. 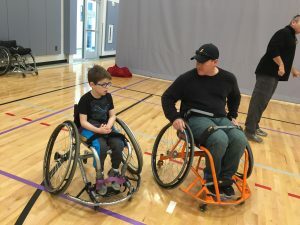 He also has swim lessons Thursday evening, horse therapy on Thursday and wheelchair basketball on Saturday. Needless to say, he’s a pretty busy guy. Our co-pays for traditional therapies and the non-covered by insurance horse therapy tends to make our bank account stretched extremely thin. We were very fortunately to hear about a foundation that supports individuals with Cerebral Palsy and their families. They have a grant program to assist in specific financial situations like ours. We found ourselves with a hefty outstanding balance with Linden’s horse therapy and were coming up short on options to pay it. This is where the Alyssa V. Phillips Foundation came to our rescue. Within less than 24 hours of me applying and giving supporting invoice documents, we were notified that our request was accepted and that the check is on it’s way. They promptly addressed our concern and unselfishly granted the funds to give Linden the opportunity to continue to ride. We are truly blessed to have their support of giving Linden the chance to have that “normal” life. 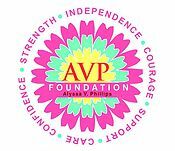 Thank you Alyssa V. Phillips Foundation! 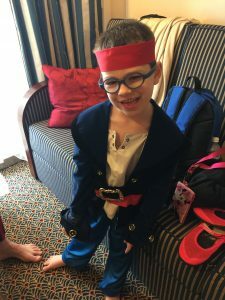 Our family had an amazing opportunity…we got to meet so many celebrities, eat some deliciously adventurous food, watch Broadway shows with some of our favorite people, and wake up with the fresh sea air every morning. 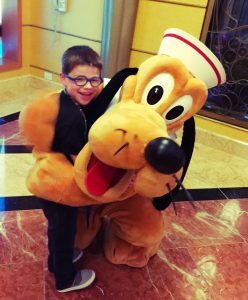 We went on a Disney cruise! We were blown away by the accommodations they made for our little Linden. They paid each and every detail to his needs and nothing was overlooked. Our gang included me, my husband, Linden (of course) and my in-laws. 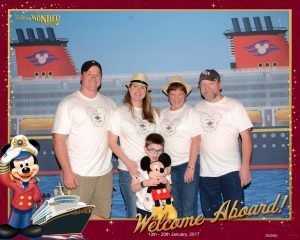 Our group of five were a stellar vacation clan and we had a blast! We had two next door balcony state rooms towards the aft of the ship. 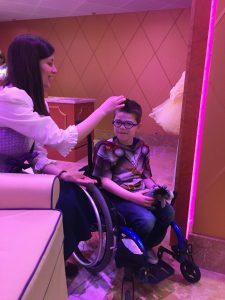 We decided to not get a handicap room as the bathrooms didn’t have a bathtub and parents with a kid with Cerebral Palsy know that a bathtub is crucial. 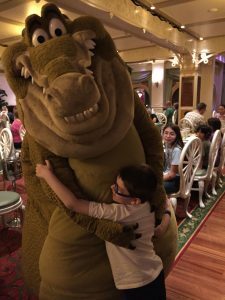 Fortunately Disney has a Special Services department and they take your concerns very seriously. They were able to give me the dimensions of the door and room to ensure his wheelchair would fit. We also requested armed chairs in all dining rooms. They even had special menu items created just for our picky eater each night. 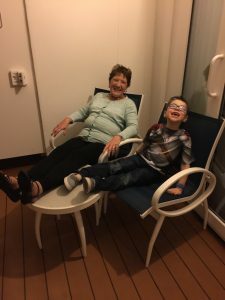 For all deck parties and shows they made sure special needs people had the same equal opportunity to prime seats and locations as the rest of the ship. These things and the attention to detail are what made this trip worth every second (and penny). 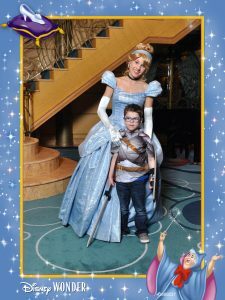 Linden got to meet some of his favorite characters but was especially smitten with Cinderella. Check out all the pictures. We had access to room service and unlimited ice cream 24 hours a day. Since we had an early dinner time we often would sit out on our balcony after the Broadway shows under the open sky full of stars and the sound of the ocean late at night and order a late night snack. This is one our families highlights. Linden was able to go back and forth from our room to his grandparents by way of the balcony. Our room steward made sure to have the doors between us open at all times and enough seating and tables for us to enjoy family time each night. We also had Linden Royal Knighted to fight off the dragons. Throughout the week he insisted he bring his sword and shield everywhere to keep us save. It was so adorable. The dining staff followed us each night to each grand and unique dining room. They were beautiful. One was themed after Triton, The Little Mermaid’s father. The second was Tiana’s Place from Princess and the Frog. They had live New Orleans music and on many occasions we found ourselves up and dancing around. The last dining room was the most fun. It’s called Animator’s Palate. The walls and drawings came to life throughout your dinner. It was amazing. We were even able to get in on the animation action. We designed some characters and when our dessert arrived so did our animations. This little green guy was Linden’s drawing. It’s dancing across the screen. Way Cool! 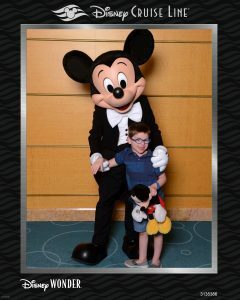 We has several stops but our highlight was Castaway Cay. It’s Disney’s private island and it was AMAZING! The sand was soft and golden. The water was gentle and sea-through. We were the only ship there that day so it felt like we owned the island. We built sandcastles, made new friends, enjoyed a daiquiri (or two), and went swimming. My husband went snorkeling and it was unbelievable. We found a sunken Minnie, boat and Dory. We stayed all and and I wished we could have stayed another. It was so peaceful and relaxing and exactly what our family needed. The hustle and bustle of our every day activities with Linden makes the weeks long and exhausting. Although I wouldn’t change our lives for a second, I did enjoy the laid back environment and still dream of being each night. 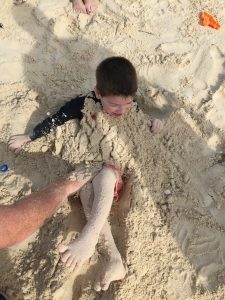 Linden loved being buried in the sand. As soon as we got close to being done he would just jump out and want us to start all over again. I’m happy we were able to give him this opportunity. We now know he loves the beach and everything it includes. After our fun filled day we got all cleaned up and prepared for Pirate Night. 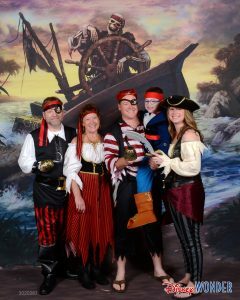 We all purchased costumes prior to sailing and were ready to mingle pirate style. 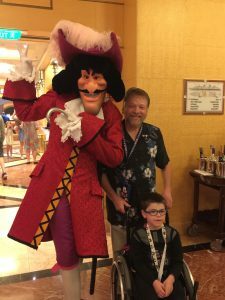 They had a fantastic show on the deck with all our favorite characters including Captain Jack Sparrow. They ended the show with fireworks. It was a blast. 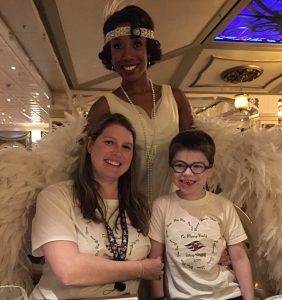 We had a fantastic time aboard the Disney Wonder for 7 days out of Galveston. This was an amazing experience that our family will cherish for our lifetime. 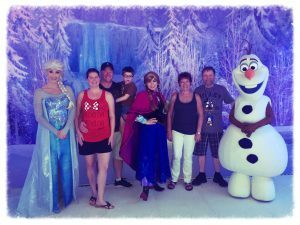 We chose this vacation because of the attention to detail they take on each individual family. They also are very serious about their special needs cruisers and that is what is most important to us. Linden was able to do everything any other child was able to do. I’d like to say we would go on one each year but Disney is not cheap. With the amazing time we had we will definitely be back though. I figured Linden didn’t have enough to do so I signed him up for basketball. 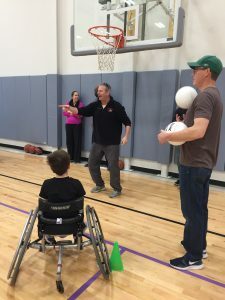 Through Linden’s twin friends we found out that the Southwest YMCA here in Austin accommodates kiddos in wheelchairs on their mainstream teams. I got in touch with the director and we were well on our way with getting Linden signed up. His first game is coming up so I thought it would be great to get a practice in. Unfortunately the Southwest YMCA didn’t have any court space available last Saturday so I reserved Hays YMCA. The plan was just to have us, the twins and their parents. This was not a formal practice. When we arrived we were greeted by a kind man, Lee, with sports wheelchairs ready for Linden. Right behind him was the coach, Mike. We were shocked! We had no idea the YMCA was able to pull some strings and get a chair ready so fast. Not only that, we didn’t know the coach was coming. When following them into the gym we were greeted by the whole team and one of the sports coordinators from the YMCA. I was almost brought to tears. Everyone came together to support our kids, our team and our movement. The kids played well together and had a great practice. It melted my heart to have everyone come together but most importantly the kiddos and coaches were so open, kind and patient. This is truly going to be a great season. I look forward to more inclusion. Go Celtics! I have one tired little man…who am I kidding…I’m exhausted! Our days are always filled with go, go, go. It feels like we’re energizer bunnies with constantly charged batteries. I often wonder how in the world Linden handles such busy days. I know he’s tired, beyond the possibility of having reason or the capability to do much in the evenings. Even knowing this, I still keep him enrolled in his evening activities. He enjoys them and talks about them fondly. I’m sure a break ever now and again would be good. The bus picked him up bright and early at 6:32 am. While he was super excited last night for the bus today, he was less than thrilled to wake up. I honestly don’t blame him. He has a full and tiring day ahead of him. I forewarned his teacher of his grumpy mood and as always she responded with uplifting words to make this momma feel better. I’ve pushing his readings on him heavily and by a couple of wake up calls, I realized I need to face reality. I want Linden to keep par with his kinder peers. Every parent wants them to keep up and continue to progress. I lost sight of “Linden” progress by watching his peers. You see his peers are reading and are quite savvy at their sight words. These are major struggles for Linden. Instead of me pushing him to read, I should have been focusing on his goals like letter recognition and sounds. After taking a step back, it hit me…Linden is moving mountains with his progress. He’s doing amazing and comparing him is unfair. He’s a smart, kind and energetic kid. He has come from not being able to form words when 2.5 years to now putting sentences together. He sings songs in full and writes his name. Those things are progress and significant at that! Accepting his amazement are valuable to not only me but to him. Sorry back to our busy day. 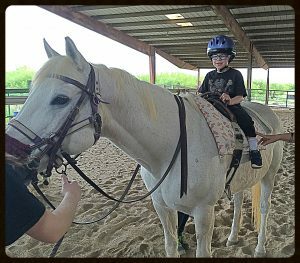 During the day I get an email from our wonderful caseworker at Any Baby Can giving me some contact resources for foundations that will possibly help pay for Linden’s outstanding horse therapy bill as well as get him an adaptive bicycle. In no time I was emailing and filling out applications (on my lunch of course; for those of you reading that I work with hahahaha). I already have a call set up for the bike. Fingers crossed! 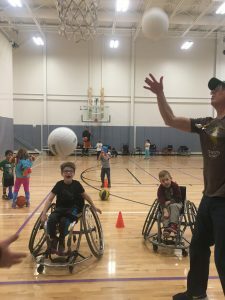 Also I received an email about setting up Linden’s wheelchair basketball practice. I signed him up with the YMCA with his typically developing peers. The Y has been amazing about accommodating Linden. Hopefully we can get him on the court this weekend with his teammates, Fin and Brenna. I’ll post pictures once I get them. After getting Linden changed, I find myself with 30 minutes of peace…wait what!? Peace!? I can sit and completely check out to la la land while his private teacher works with him…..of course I don’t. I watch and smile with adornment. He’s doing so great. He’s mastered floating on his back, standing in waist deep water and blowing bubbles. Instead of having a second for me, I stay in the game. I stare at him and just reminisce on where he was and where he is now. He amazes me everyday. Done! No we have to wait for the handicap bathroom first so we can get changed. Pet Peeve Alert!!! Seriously these bathrooms are for those that “need” them. They have locker rooms for a reason. It infuriates me to wait for 20 minutes while a mom and her teen girls take up the bathroom for who knows how long when there is no need. LOCKER ROOM! My son can’t go into the women’s locker room per Y rules and due to his need for a handicap toilet and such we need that bathroom. If it happens again I will for sure speak up. Now to get dinner. I’m too tired to cook nor fuss with leftovers so fast food it is. Of course it’s an argument…he can’t make up his mind if he wants a burger or hotdog (mom won and he got a hotdog). After 4 trips from the car to the house just to unload everything, we can finally sit down to eat. Boy we were starving as we ate it all! Linden picks the most inopportune times to go #2. You see, we are still working on using the toilet for his business but he’s terrified. So while we slowly work on that, he uses a diaper. All I wanted to do was give him a bath, take a shower and go to bed. Things just can’t be that easy. Well after a strong will child made bath time not so fun, he is fast asleep. He was tired! I am tired! I must say being a single momma on daddy’s shift days are exhausting. Not really sure how I found the energy to blog tonight. Actually I do…hear me out….. Families of special kiddos are never on break. We are on call 24/7. We are always rushing to something; doctors, therapies, school….We are in constant movement; helping with the potty, washing hands, making special food, preparing sensory safe clothes, sewing patches in his knee holes from crawling, horse therapy, swim lessons, bath time, teeth brushing, getting dressed, putting on and off orthotics, nightly medicine routine, prepping for his special lunches, making two meals (because you know he won’t eat the first), playing guess that word (sometimes he’s hard to understand even for me), gait training work, follow up therapies, verifying that all his communication devices are charged and ready to use at a moments notice, homework…..the list goes on and on. So if you see one of us and it looks like we are in a daze, give us a moment. We need it! So here is my shout out to all the special needs parents and guardians as well as those single parents…KUDOS! Your dedication and optimism are what make our kids great. 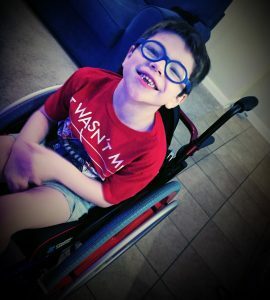 Finally after what feels like eternity, insurance has approved Linden’s new wheelchair and it was delivered yesterday. With its flashy red wheels and tricked out functions, Linden is riding in style. It took a bit to get to this point. We have private insurance and boy has it been a hassle to get it approved. I believe the entire process took 9 months. His first chair was starting to break, pieces falling off but most importantly he was way to big for it. His weight became to much for it and it tipped quite a bit. After 3 attempts for approval, 2 appeal processes and countless hours on the phone insurance gave us the green light. Honestly I bring this up because I think we need to start really talking about the lack of consideration and safety private insurances are providing. We shouldn’t of had to send our child to school in a ratty chair only because money was more important to their CEO’s pockets. I recognize and advocate for all rights for children with disabilities including those on medicaid. I think we need to talk about private insurance coverage; or lack there of. I found myself having to reach out to different foundations to help me fight with insurance. I had the medical equipment supplier company, Linden’s physical therapist, his neurologist, his PCP, Friends of Man, our family friend social worker and Any Baby Can. Count it! 7! It took seven others outside of Linden’s family to help in the fight. Ridiculous! If you count my husband and I, that makes 9 people, 9 INDIVIDUALS! My hours of calls all began and ended the same. I remained calm and professional but gave examples of how his safety was being compromised daily. No matter how many scenarios I played out for insurance the answer was still no. Finally the week of Thanksgiving, insurance approved the repeated requests. Seeing that we meet our out of pocket quite soon in the year due to Linden’s therapies and such; I prayed that his chair would arrive before the end of the year. It arrived with 2 days to spare, phew! 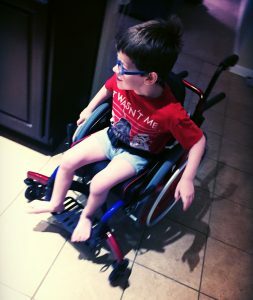 Linden absolutely adores his set of freedom wheels. He’s mastered the new chair in a matter minutes of its arrival. His first outing was to his swim lessons and without a hitch he was back to the hang of things. 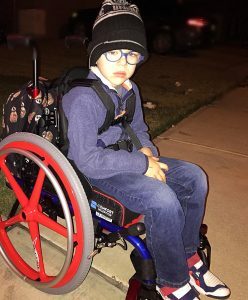 I look forward to his friends admiring his new chair when school starts again. His friends are so great with him and I love that they accept him as the same and see no different. This wheelchair is one of the many battles we have had with insurance but I’ll save those stories for another day. For now, we rejoice in his new and safe chair. A little over two years ago my older brother passed away. He was extremely sick for a quite a while and unfortunately lost his battle. He was the nomadic type. He loved to travel and see the world, from the mountains to the oceans. He was the most generous person I’ve ever known. He’d give the shirt off his back in freezing temperatures if you needed it. While he was living we didn’t always see eye to eye and I regret not being more understanding and loving. I wish Linden would have really known him however he was too young to remember. 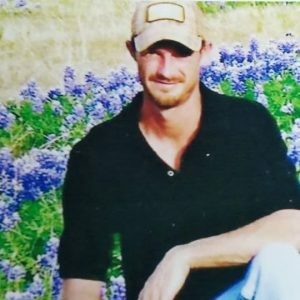 Jason’s last travel was to Colorado where he had his last seizure that left him unconscious and unable to fight for his life. By his side was his loyal companion, Hurley. 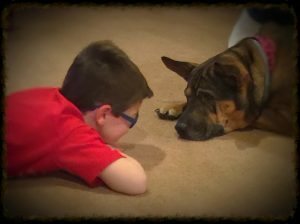 She became his service dog years prior and had made it her priority to save his life. She did everything she could do that day but unfortunately it was his time. My parents were torn with the decision to let Hurley go back into service for someone else or bring her back to Texas. She was the last connection to their son. Hurley adjusted quite well with her new home at my parents and in fact this is exactly how it was meant to be. Jason is smiling from Heaven. Hurley immediately became my parents companion and watch dog. She is the most loyal, loving and extremely gentlest family member. Linden and her are best buds. Hurley is gentle with him yet plays along with him. These two are joined at the hip and it’s comforting. It’s like Hurley knows Linden is not like other kids and protects him from harm. I often wonder if Linden would get a service dog and if they would be like Hurley. But no other dog can out do our Hurley for our boy. We look forward to getting to see Hurley when we visit my parents and until then Linden talks fondly of her. 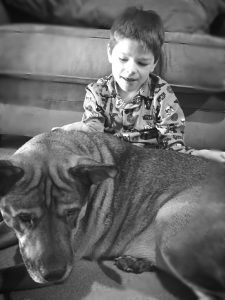 A Boy and his Dog…….